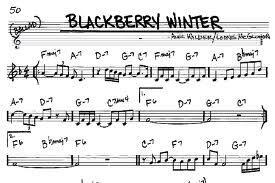 "Blackberry Winter" is a ballad by Alec Wilder & Loonis McGlohon written in 1976. It's been recorded by Keith Jarrett's trio and Marian McPartland, among others. Art Olson is a pianist who posts videos of him playing jazz on fine old pianos from Artistic Pianos in San Diego. I asked if he'd mind my adding a bass line to his piano part and he said fine, he'd like to hear it when finished. The tune was recorded in my Nashville home on a tiny Sony Walkman NWZ S-544 February 18, 2014. The bass is a Turner Ren 4-string fretless with gut Thomastik-Infeld strings run thru a Radial DI into an SWR 12" speaker. The recorder, such as it is, was placed on a table and let rip.